The way we all live our lives has a huge impact on our planet. 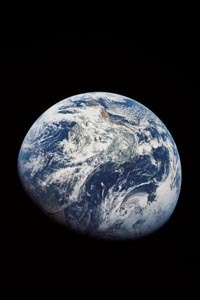 We are currently consuming the Earth's natural resources at a faster rate than the Earth's ability to replenish itself. The loss of rainforests to satisfy our demands for tropical hardwood, damage to landscapes resulting from the extraction of coal and other minerals and over-fishing of many of the world's fisheries are just a few examples. The burning of fossil fuels (coal, gas and oil) to support our activities is contributing to climate change and the carbon emissions we produce are more than the planet's natural systems can absorb. All of these things mean that we, in the UK, actually need three planets to support our current lifestyles...but we only have one. We need to find a way to live within the natural limits of our planet, ensuring that everyone can lead happy and healthy lives and have a fair share of the Earth's resources without compromising the ability of future generations to do the same. That's what sustainable development is all about.